And so it begins… Collapsing crude prices are starting to make their way through the North American energy sector, as the most unprofitable oil & gas rigs are mothballed. Those flashing red numbers are not just on your screen any more. The closures have been particularly acute in Canada, where some 40 oil & gas rigs have been taken out of operation recently. In fact it's not clear if economists fully appreciate what's about to transpire with the Canadian economy. This decline in rig count is just the beginning. Consider for example the situation with the Canadian oil sands - one of the more expensive sources of crude production. Even if prices recover somewhat, oil sands production will be winding down - nobody wants to operate money-losing businesses for a prolonged period. And those who believe crude will be back above $80/bl any time soon is deluding themselves. Up until now, production from oil sands has fueled growth in other sectors, including for example transportation and housing in Alberta. This is about come to a screeching halt. The national situation is not significantly better. Housing markets across the country have continued to rally, even as homes south of the border had undergone an unprecedented price adjustment. While many point out that the reason for avoiding a US-style housing crash has been a stronger mortgage market, that's only part of it. The global commodity boom in which Canada successfully participated is the main reason. Now as the commodity super-cycle has ended and energy prices collapsed, Canadian households are caught with near-record levels of leverage. 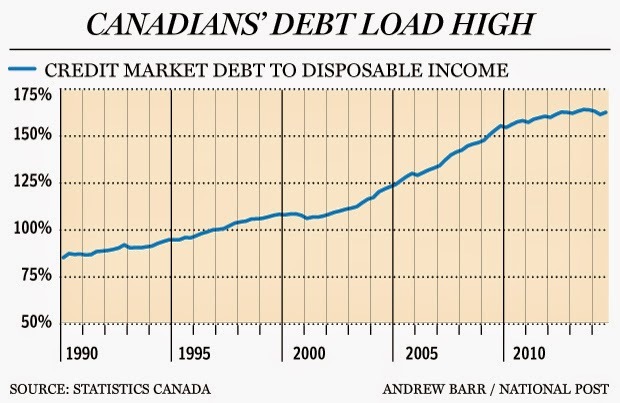 Some have been pointing out that Canadian mortgage debt service ratio has continued to improve. However that measure is misleading, as it excludes principal payments. In reality the situation is much worse (see chart, h/t @ac_eco). There is also the argument that Canada's economy is "diversified". Perhaps. But just to put the situation in perspective, take a look at the breakdown of the nation's trade balances. While economists will attempt to analyze the impact of energy prices on various sectors separately, when it comes to Canada, a number of economic components are quite difficult to decouple from one another. What's clear is that this exposure to energy is going to damage the labor markets, squeezing the nation's overextended households. And the knock-on effect won't be limited to a severe slowdown in residential construction growth. Consider for example the expenditures on renovations - something that's been supporting parts of manufacturing and other sectors. This is not going to end well. The markets are already sensing the contagion effect from energy on the housing market, as Canadian property REITs take a hit. If oil prices remain anywhere near the current levels for a prolonged period - something the Saudis are aiming for (see post) - Canada's economy is in serious trouble.